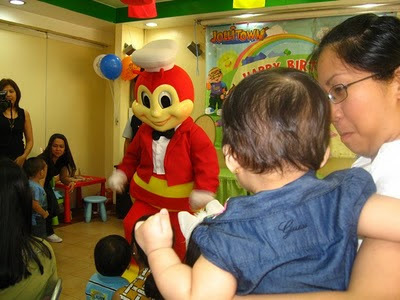 After the fun and grand Bebots/twitter friends EB at Astoria last Feb. 19th, we all attended the Jollibee party at Blue Wave in Pasay City given by Glo to all the Bebots kids. It was a lot of fun I can say because not only the kids enjoyed but we adults enjoyed it as well. I'm so happy to have been part of these fun group that started online, we have really bonded through the years. Our conversations are endless from our love and hobby digital scrapbooking, photography, parenting, income generating sidelines, food, celebrities/gossips, travels and even insurance online, we never fail to share our ideas and thoughts. 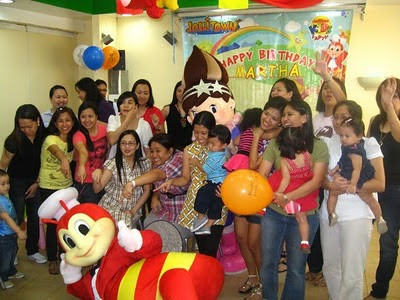 I hope we'll have more gatherings like EB and or party. I always envy those that can drive a car most especially women. In other countries it’s not surprising to women drive cars for it is really a must and a necessity to drive. Back here at home, not all women know how to drive or even have a desire to drive since we have lots of mode of transportation that is readily available. There’s the jeepney which I think is the most used mode, buses, metro rail transit, tricycles, fx/taxis, and pedicabs. My cousin just recently learned how to drive when she enrolled in a driving school and she’s encouraging me to do the same for she says it’s quite liberating. Tension and being scared will be there while learning but she overcame it with flying colors. With her husband abroad, she conditioned herself to drive and she’s driving with confidence now. I also have a desire to drive a car but knowing myself and my limitations, I reckon I’ll be hard to convinced to drive a car even if it is a Toyota, kia or even a ford mustang which is also know for it’s sleek features and performance. Hmmm.. Maybe one day when I’m ready to set my foot on the gas or breaks and my hands on the stirring wheel, no one’s gonna stop me form doing what I desire. Kids and babies are the ones we need to make extra precautions during summer, prickly heat and now that TIGDAS or measles has been reported to be an outbreak. For mommies out there, you need to be alert and keen on noticing changes in your child's health for these days being sick is so expensive and you don't want to see your children in the hospital lying in bed with either oxygen, pulse oximeter or dextrose attach to them. We have to make sure that we drink lots of water or juices to keep us hydrated, keep our backs dry (most especially kids), stay out of the sun, drink vitamins, put sunblock and we need to stay away from people with sore eyes or skin skin lesions. Wow it's so darn hot yesterday afternoon that I almost got dehydrated after running a quick errand and going to the nearby tiangge at our place. It's not only exhausting but it's burning to the skin, that always reminds me that too much staying in the sun not only makes our skin dark but it can be prone to fatal skin cancers. 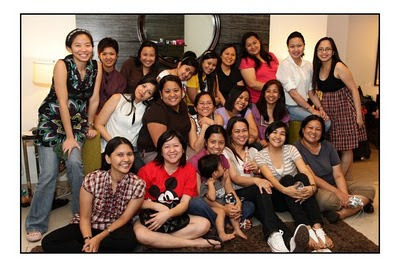 It was last Friday (Feb. 19th) when we all gathered together at Astoria Plaza Hotel for our grand EB with the balikbayans Glo and Trin who came all the way from the US to meet us all. I came around 11:30 am and later on Bebots came one by one either alone or with their families' in tow. Some also checked in at Astoria to spend the night there. Astoria is a nice hotel near Shaw Blvd., the room was spacious to accommodate us, it got some nice decors and amenities. We are 21 all in all but sadly Kathy didn't make it that day because of unforeseen circumstances that's why we only talked to her at YM and envy her. It sure be fun it was there in Astoria. 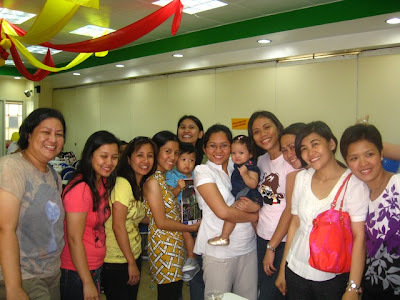 We ate all day, played Pinoy Henyo game, there was also a raffle and endless chit chats. It was a RIOT!!. It was so fun that I will not forgive myself if I did not attend. We only met online via digi-scrapping forum in 2007 and twitter and there we bonded and formed a special friendship that we all can cherish. Some left at around 10 or 11 pm while me, Buge, Zanne, and Diane stayed at Glo's room where we still chatted to early morning, Me, Zanne and Diane slept in one bedroom still talked till 2:30 am lol we were so sleepy by then..lol It's fun to meet you all girls. Hope we can bond once again soon! My niece Micah came home for a vacation from Sydney last December till January of this year and I became her chaperone when she wants to go shopping. She actually saved money by working as a barista in one of the coffee shops in Sydney and she spent some of it doing endless shopping with me. 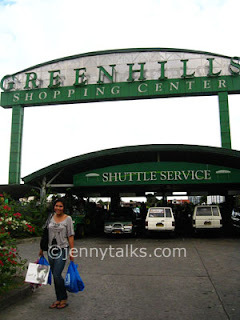 There was one time when we go to 2 different malls SM megamall and Greenshills just to buy all the stuff that she wanted. She bought items like dress, shoes, blouses, jeans, shirts, headbands and lots more. It was so cheap to shop here compared to their shops back home plus there are myriad of choices that she can choose. She even shopped items for her bestfriends and closest friends. She got a good deal over here but her luggage became so full and overweight when we packed it. Anyway, I know she will miss our shopping days most especially when I tried to scold her because she wants to buy a 3-4" heels sandals..LOL We are sometimes a cat and a dog most of the times because she doesn't want to be told what not to do and wear. You know teens think that they know it all but I am glad with a little bit of explanation she still follows me. 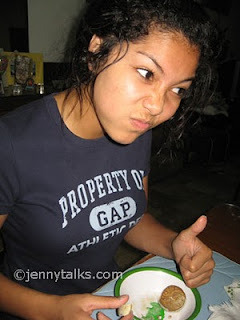 Now I really know that it's so hard rearing a teenager these days. You'll encounter problems regarding discipline, matters of the heart, acne problem where you always wants to get only a natural acne treatment, school matters and more. I bet mommies out there with teens too encounter same problem. I hope my net cafe will slowly pick up soon most especially when the school year is closing on March or April where students are obliged to make projects. During these days, students will be flocking to use the net so that they can research on about their assignments more particularly about their projects to be submitted to their teachers. There are also times when I need to extend my closing hours just to accommodate rushing customers who wants to use the computer, net or those that wants to have their documents printed. I have this paper where I printed all their documents and my customers loved it because of it's quality. It's actually smooth and when their projects or resumes where printed it looked more presentable unlike using just an ordinary paper. My HP printer is also a big help and it prints with quality because I only use original HP printers. I once used a refill cartridge on my old printer and it only ends up being broken giving poor quality and I end up buying another printer. It saved me some money at first but later on I was at the losing end bec. I need to replace the printer. Those of you who have printers at homes and offices, try to use only original inks of brands like HP or Canon Ink Cartridges for superior quality. These days original inks are affordable now and readily available online and so I see no reason why people will still want to use refill ones. InkCartridges.com is a good source of branded printer inks, ink cartridges, laser toner and lots more. They carry brands like HP, Canon, Dell, Brother and more. 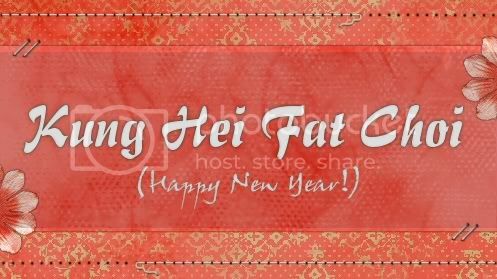 New season of Amazing Race is on again and for sure you'll be reading posts and results of my fave AMAZING RACE here on my blog. The show started today and the Result of The Amazing Race 16 Episode 1: Dana & Adrian (High School Sweethearts) are Eliminated. I can't wait to watch the succeeding episodes! 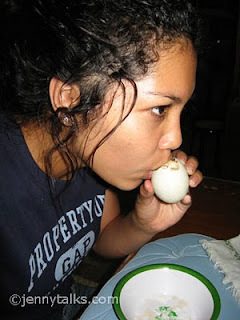 It's Her 1st Time to Eat Balot!! Have You? 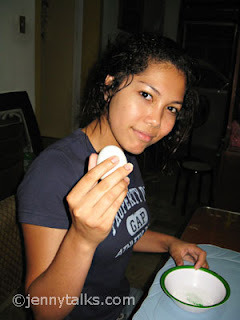 My niece Micah (who had a vacation here in Pinas last year) was dared by his cousin to eat balot one night after they went for a body massage. She has never eaten it simply because there's no balot in Sydney hihi. 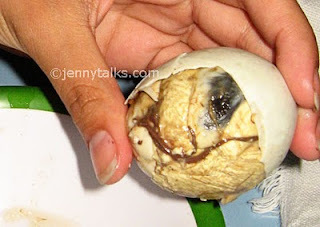 Balot (balut) is a boiled fertilized duck egg and it is usually eaten with salt while some prefer to put vinegar on it. Balot are sold on the streets, you can easily find one being sold on side streets inside a basket and sometimes there are vendors roaming around yelling "Balot.. balot!! balot is also known as an aphrodisiac. 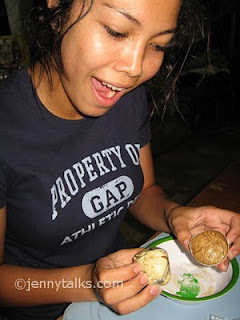 Anyway, here's Micah trying her first taste of balut! She was a excited to know how it tastes and how it looks like so without any qualms she gave it a try and in the end she liked it. I also love balot but I don't eat that often. What about you, do you eat balot? Our US based co-digiscrappers/twittermate friends GLO and Trin are already in the country for their vacation once again. Trin was here last year and we had a get together party where Bebots (as we call ourselves) meet Trin at BSA Tower in Makati last April 2009. This year, Glo came home so we are going to have a Grand EB on Feb. 19th and this event is something that we should not miss. Glo and Trin will be hosting the party and for sure this will be one super riot party just like last year. Our friends Zanne who is from Cotabato and Diane from Albay will be flying just to be at the grand EB. I remember last year we stayed up late having some girl talks and all of us are catching our breaths after laughing so hard. Topics discussed are wide ranged from digi-scrapping, love life, quick weight loss tips, shopping, chismis, celebrities and lots more. This year there's no doubt that we'll be laughing and making chismis once again. See you girls!! Finally it arrived and I was flabbergasted to see what came up in my dashboard. Want to know what is it? Loads of works and that only means that I'll be extending my working and waking hours a bit just like tonight. It's already past 12 midnight and I still have energy to blog. Why not? There's a happy news. All my friends are rejoicing as well. Actually, lately I found myself sleeping a bit late because I'm also been hooked looking and bidding at e-Bay..lol I hope I will not need the best sleep aid in the future because of lack of sleep. Anyway, I need to get myself off here to watch the late night news and hopefully catch any late shows as well (if there's still left haha). See yah. What? 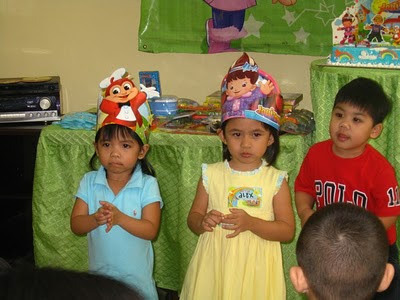 I just heard in the news that there will be a Rotating Brownout soon in Luzon probably around Feb. 16- March 11, 2010!!!! Oh my goodness, another dilemma to come. It is said that there's a critical low supply of electric and some stations are shutting down due to low supply of banker oils. Oh dear that only means that days will more hotter and it;s gonna be another uncomfortable and boring hours without electricity. I hope it will not last long because many will be affected and that includes my net cafe :(. 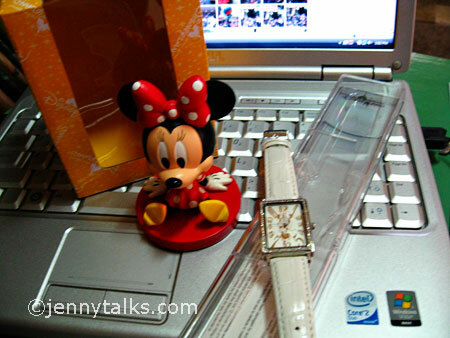 I'm not really a Minnie Mouse fan but I got myself these cute Minnie Mouse paper weight and Minnie Muse leather strapped watch when we visited Hongkong Disneyland last Dec., 2009. 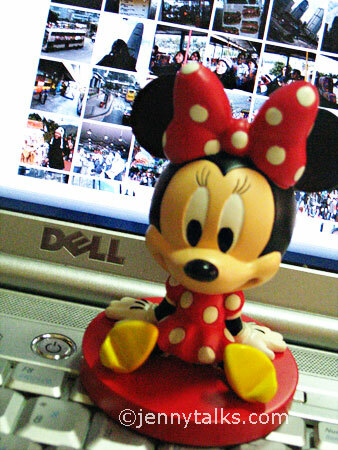 There are tons of souvenirs available but with lil pocket money I have, I opted just to buy these for myself hehe. 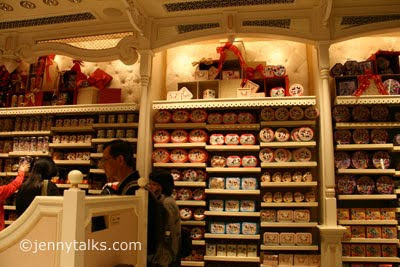 Here are some photos I took inside one of the souvenir shops at Hongkong Disneyland. 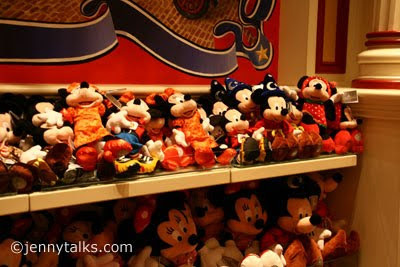 More souvenir items that you can purchase. Finally..... I'm not a Loser Anymore.. LOL! Finally after million years, I joined Facebook...lol I've been postponing it not until this afternoon. I have lots of friends plus my SIL, my nieces and nephews have been encouraging me to join Facebook but I always turned down their request simply because I don't see the need to have an account there. I just thought that it will also become an inactive acct like that of my Friendster acct. because after such time I became too lazy to update. I never thought I will join FB's bandwagon, but this afternoon when I saw some photos of my cousins in the US at my sister-in-law's account, I realized I needed to re-connect with them even on facebook. After resizing some pics and setting aside my research about pond fountains, I went to Facebook. I still have lots of clothes and other stuff given by my sis Joy to be put away and put in proper storage. Some are still lying on the floor while some needs to washed or ironed. I need to have some time to do all of that but I still feel lazy hehe. Last holidays, sis Joy sent us 7 balikbayan boxes full of toys, clothes (new and hand downs), house items and lots more that she accumulated. They also recently transferred home so all her not used or will not be used items in the house are put in the back to be used us here. Many have been blessed with all the stuff that she gave, there are more in the big boxes but we didn’t gave it away yet. My niece also left some of her clothes back to Sydney so I was able to use some while I gave some jeans and shirts to my niece. Looks like we need some more space in the house to have room for all our extra stuff, a self-storage maybe like what they have in California. People ‘round there are also having problems with their space and storage so they are opting for self-storage. Allaboard.net has Anaheim Self Storage and in other locations giving people a safe place to store and manage their personal or even business stuff. 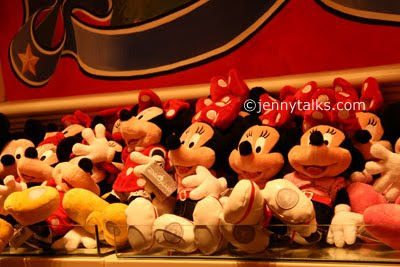 BTW, I also need to de-clutter and organize my closet and give them to my niece. It’s just give and take. The house looks like a big storage place and like what my sis Joy said it looks small now because of all the decors and things that we have. Ooopps.. I better get things organize and make our house more clutter-free. Happy New Year from my wacky family! A late post but it's still worth sharing. Been too busy during the holidays and till January that's why. It was really a blast for all of us. My sister Joy and her family from Sydney is in the country that time to celebrate the holidays and look we all enjoyed it. 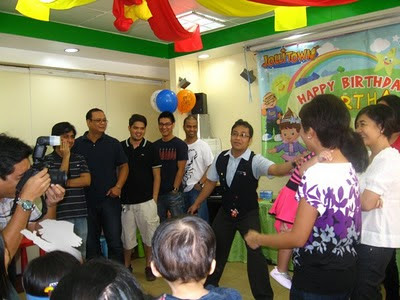 While waiting for the 2010 to arrive, we sing at the videoke, kids play games, we sing and dance, eat/ drink and take lots of photos. It's also family tradition of ours to wear RED shirts for good luck and prosperity. We have been doing this for years now and I am the one who initiated it. Oil price hike, electricity going up as well as prime commodities. So what else is new? We have every reason to tighten our belts for sometime and hold on for the economy is shaking a bit, or is it always? Every industry is affected but I noticed that food business will always be stable since we all need to eat anyway. Others seem not affected as they continue to invest and buy gold bullion for their future agenda. I first saw this Rica (Carla) Peralejo (actress/host) and Joe Bonifacio’s (pastor) Wedding Video by Jason Magbanua at Umagang Kay Ganda TV show this morning and thought I'd search for this video at Jason Magbanua's blog to share it with you.Rica and Joe tied the knot last January 29, 2010 on a beach wedding at Kawayan Cove, Nasugbu, Batangas. Jason Magbanua's wedding videos are movie-like, his choice of music is great and you can feel the love of the couple in his videos. Watch his other wedding videos and you'll feel like you want to get married soon or again. I'm just wonderin' how much is his fee? Hmm for sure it was ceiling high. Oh gosh, I was shocked and angry when I her this news from my sister in law. 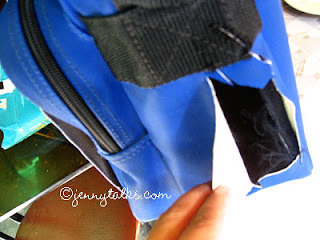 It turned out the my niece's bag was slashed (AGAIN!!) inside the jeepney last Friday on her way home from the university. I was able to talk to my niece as well and asked her what happened. She said it was around 8-8:30 pm on her way home from UP, she rode the jeepney Katipunan -Sta. Lucia route. She was seated between 2 guys and other passengers. For sure the criminal saw where she puts her wallet back after from paying. 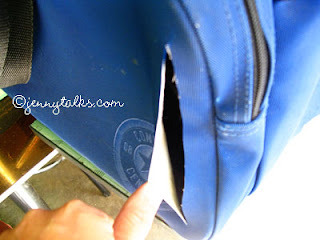 She really has NO idea that her Converse bag was already slashed not until she got off the jeepney, boarded another jeepney and she was about to pay. Look at how awful that criminal did.! 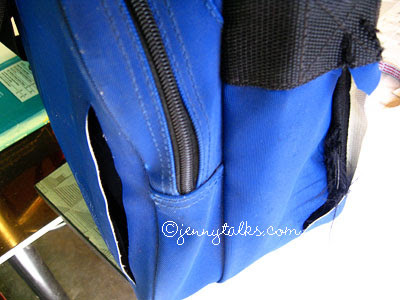 She looked at her wallet which she put in the front pocket, and there's none and she saw the big hole already. Then saw another big hole in the bag which she never noticed. I told her she MUST have slept inside the jeepney that she didn't even noticed or felt that someone is already getting her stuff. She said she is fully awake and her hands where over her bag and books. I also assumed that people inside the jeepney must have seen the crime but too afraid to tell, of course because of fear. The guy in her left must have a very sharp knife that she opened the bag and he is quick enough to get the Wallet, make-up case and her pencil case !!! We are also thankful that it was not a holdup and that she was not threatened. Snatchers and other criminals really have no pity over their victims, I only wish that someday they will get caught by authorities or if not they'll die and suffer. Sorry for cursing but they are scary and should not be allowed to be roaming and victimizing more. So be careful everyone esp. those that commute, it's getting scary each day! So how important a brand name for a product? It’s totally and inevitably very vital in ones business. Brand name will be the face of your product and it’ll be your chain between your consumers. A catchy and easy to remember brand names are definitely a plus. Owning a business is already a hard work but how much more is the promotion and selling to your consumers. It’s a lot of work and dedication but if you really want to succeed, and if you have the passion and you believe in your product, there’s no doubt, you’ll do anything and everything to make it work and click. It’s a thorough research and endless brainstorming. Gimmicks and promos are expected. Naming Company like BrandIdentityGuru will come to the picture to lend a helping hand for companies who needed a professional advice and approach when it comes to naming, branding and promoting your products. They have various services that are worth looking into if you have a business that needed branding, marketing strategies and more. We have seen lots of products that are successful, take a look at their brand names, logos, tag line and of course the product that they are offering and for sure they have thought much about it. Take for example your fave hamburger chain, isn’t it amazing that when you see their logo or mascot then you can easily recognize their product? It only means that their brand has already touched their consumers.